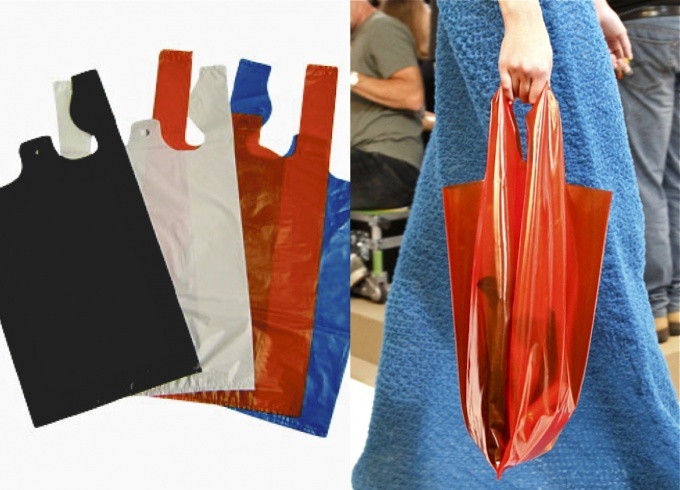 Plastic bags from shops and supermarkets is very inconvenient to store: heaps of polythene takes a lot of space. You can take for their own drawer in the kitchen or to purchase a special packetize – and you can learn how to add packages to the triangle. This saves about 20-25 times, in addition, allows you to make storage convenient: the package of the desired size and density required in this case. Spread the pack, place it on a flat surface of the table and the iron hand in the direction from the bottom to the handles. Fold the packet in half lengthwise, and then again in half. Several times iron hand – the less air will remain inside the package, the more dense and compact work triangle in the end. Start folding the resulting polyethylene tape, starting from the bottom. Fold one of the bottom corners to make an isosceles triangle and press firmly to the tape. Continue to fold the package podrachivaya the tape to bend every time I make a triangle, until you reach the handles of the bag. Periodically iron the package by hand to remove excess air. Tuck the handles of a package Mikey in "pocket" formed by the bend of the triangle. If you fold the package with die – cut handles, fold the remaining part of the package of "counter" in a triangle and also fill in the "pocket". Fold the package so you can for 20-30 seconds. The resulting plastic triangle can be stored in the box reserved for storage of packets to carry in your bag or pocket – it is quite compact and flat, not falling apart, and takes up very little space. To bring the package in "working" as you pull the handle from the "pockets" and holding over them, vigorously shake by hand. Folded package width four times – a good option for packages of standard size. For small packets (for example, A4 size) will be three additions. Large packages (such as from a Shoe or hardware stores) can be folded 6-8 times. More – desirable, the polyethylene layer will be too thick and the triangle will collapse.